What a place to be for a morning walk in deep powder, nearly-weightless snow. In this painting, I wanted a calm and silent mood with the cool mountain air in the valley and brilliant tones of changing colours on the massive Three Sisters Mountain as the sun rises. 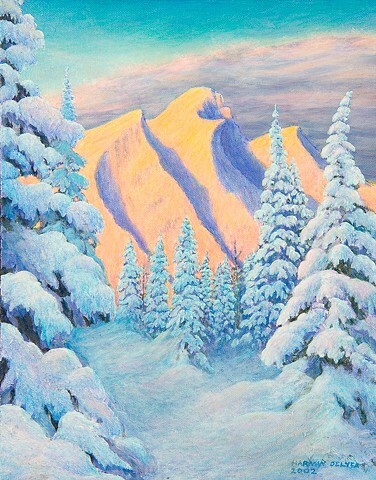 This painting was created from memories of many winter walks with my wife in the mountains. Winter Morning,Trinity Mountain/Three Sisters, Fernie, B.C.